You’re in the market for seat covers for your truck and there’s an overwhelming amount of options for you to choose from. It can be pretty daunting trying to narrow down the search. This guide will help you figure out what the best seat cover is for you. As you start your seat cover research, you’re likely wondering who makes the best seat covers for trucks. 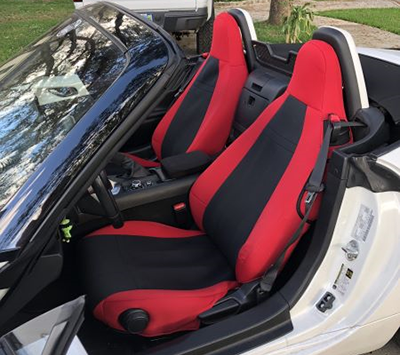 In general, you should be looking for a company that sells automotive grade, custom seat covers that come with a fitment and quality guarantee. At ShearComfort Seat Covers, we use high quality automotive grade material to make all of our seat covers. Each set of custom seat covers comes with both a fitment and quality guarantee as well. Before ordering anywhere, it is a good idea to read through both the warranty and the return policy sections to ensure that you can order with confidence. Reading through a site's reviews is also a crucial part to ordering seat covers as it gives you feedback from customers just like yourself. Once you’re sure that you can shop for custom seat covers without worrying about quality or fit, it will become a lot easier to narrow down the selection and pick the best seat cover for your truck; one that suits both your wants and needs. This is when it can get a bit daunting because there are tons of seat cover options for your Dodge, Ford, or Toyota. But you might be asking yourself, what are the best seat covers for my truck? As such, to make the research process easier, here are the best seat covers for truck drivers for both daily drivers and work trucks. What Are The Best Seat Covers for Work Trucks? We’ll start by helping you to determine what the best seat covers for work trucks are. Take it from us: when you use your truck for industry use, it can really take a beating. It is best to install seat covers well before the damage occurs. Right off the bat, we’re going to give you the lowdown on the very popular, very well-known CORDURA® Seat Covers. You’ve likely heard about this material before, and with good reason: It is extremely high quality, high wearing, and highly protective. For a truck that is used in light, medium, or heavy industry, having a set of CORDURA® Seat Covers on its seats will ensure that no damage will occur on the job. The canvas-like material is tightly woven so that no dust or dirt will embed itself into the material. Additionally, CORDURA® Seat Covers will protect your seats from sharp tools or objects that come with the job territory. You’ll be happy to know that this material is also 100% waterproof. This level of protection is really geared toward heavy duty uses. 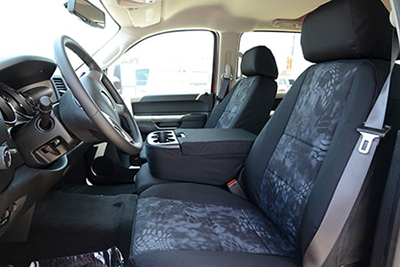 Atomic Pro-Tect Seat Covers , much like CORDURA® Seat Covers, offer an extremely high level of protection for trucks. If you’re someone who just doesn’t have time to waste worrying about spilling liquids or throwing work gear onto the seats, Atomic Seat Covers are ideal for you. These custom seat cover are a cost effective option for truck drivers who are looking for something tough and rugged. While the cost might be a bit lower, this does not mean the protection level is lowered by any means. The seat covers are made of polyester with polyurethane that are both waterproof and UV protected. Atomic Pro-Tect seat covers will stand up against almost anything as they are also abrasion resistant. They are made of an automotive grade, canvas-like material suitable for industry use. The material is strong enough to protect your seats against sharp or heavy work tools and protect your interior from dirt, dust, and debris while on the job. All the while, still giving your truck a stylish, clean look. For a material like this, you want to be sure you need this level of protection. If you’re ever in doubt, read our reviews, use our Suggestion Seat Cover Survey, or contact our order desk. Our Pro-Tect Vinyl Seat Covers bring things back to basics and offer drivers a very simple-looking product while having exceptionally protective qualities. This lower priced option is great for mechanics or oil rig workers as the heavy duty material is extremely easy to wipe down and clean. The material also does not absorb spills or substances, like oil, so you won’t have to worry about leaving a stain and you can spot clean these seat covers as needed. Also geared toward work trucks, you’ll be able to throw wet work gear or sharp tools onto these seat covers without worrying about water soaking through or piercing the material exposing your original upholstery. When you’re a fan of Camo, there’s no sense in hiding it! 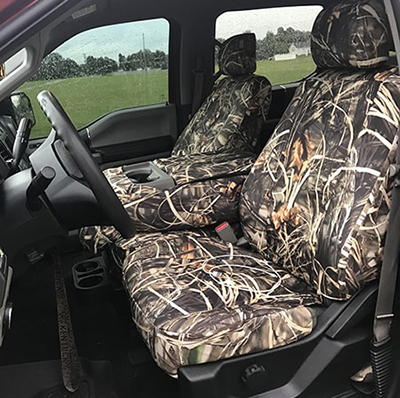 Even better is that when you use your truck for work and love Camo, our Realtree Camo Seat Covers are exactly what you need: protection and style all-in-one. Using a high wearing, canvas material, similar to Atomic, you’ll be able to choose your preferred Camo pattern and protect your seats from heavy duty use. Beyond just being great for a work truck, these seat covers are also perfect for hunters, campers, fisherman, and any other outdoor uses. Our Realtree Camo Seat Covers will fully protect your seats from water, tools, and extreme use. We offer the most popular patterns -- all living up to the same quality and detail the Realtree brand is known for. We also have other Camo patterns for you to choose from. You can order truck seat covers in Mossy Oak, Muddy Girl, Moon Shine -- all made of the same heavy duty canvas car fabric. Another custom seat cover we offer that qualifies for our Luxury Line. Who said heavy duty can’t also be luxurious too? Our Kryptek Seat Covers take extremely high wearing canvas materials combined with the same outstanding attention to detail and level of detail as other products in our Luxury Line. This gives you serious protection and a seriously good looking set of seat covers. The unique Camo patterns will also transform your vehicle, customizing it to your liking by using our custom color selector. You get to really make these truck seat covers your own. As an additional accessory, you can add on the Tactical Seat Cover Package. This package will add additional pockets, including an option to add a pistol pocket. 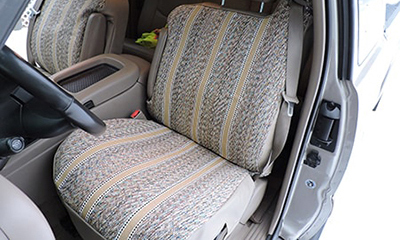 For a more economical option for your truck, we offer OEM Seat Covers. 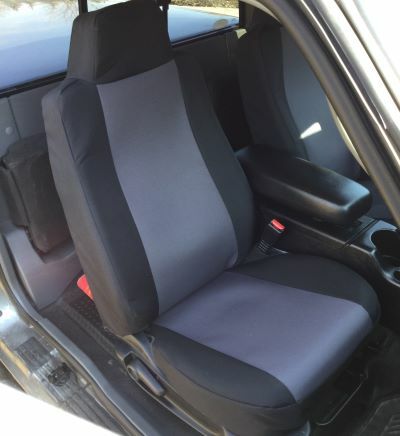 This “original equipment material” seat cover uses a run-off of automotive material used by manufacturers (not your specific vehicle’s existing upholstery). Offered in three different colors: Tan, Gray, and Black, you can select a color that will compliment your car interior. The simple and clean look of our OEM Seat Covers will upgrade your trucks interior without completely transforming the look of your seats. While these three colors will compliment your car’s interior, they will not be an exact match. Whether you know it as Horse Blanket Seat Covers or Saddle Blanket Seat Covers, these are a great choice for truck driver who want that Western look and a great deal of protection to boot. The tightly woven material is extremely durable, highly water resistant, and very easy to clean. While the price for these seat covers is less than other options, it by no means indicates less protection. Our Saddle Blanket Seat Cover have been coated and are water, fade, and abrasion resistant. What Are The Best Truck Seat Covers Geared Toward Daily Drivers? Not all trucks are used for industry or work purposes. Sometimes you just love to drive a truck to and from work or cruise around town. Or other times you’re a long haul driver that spends a large portion of your day driving your Dodge, Ford or Toyota truck. 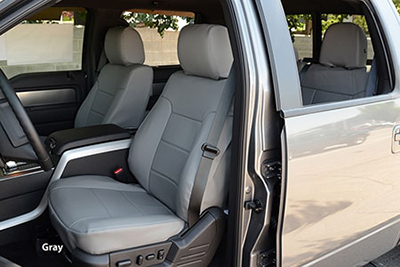 There are suitable seat covers for trucks that are daily commuters -- ones that protect, but don’t need the tough and rugged protection of other heavy duty seat covers. One of the most popular seat cover types on the market, Neo-Supreme (or Neoprene) Seat Covers are the best of both worlds for daily commuter trucks. You’ll have a solid amount of protection, but also a solid amount of comfort while driving. This material is best suited for truck drivers who drive long hours, but do not use their truck for industry purposes, like construction (we will get to the best material for this use shortly). This wetsuit-like material is geared for automotive purposes, so it isn’t like the real Neoprene that will crack and fade if left in the sun or not treated. Our Neo-Supreme Seat Covers are highly water resistant and UV protected as well. With the automotive fabric being extremely form fitting, Neo-Supreme seat Covers will fit like a glove. In fact, many customers have said they look like a second skin. Imitation Leather, also known as Leatherette, is an ideal product for someone who wants to have that leather look, but for personal (and cost) reasons doesn’t want genuine leather products. Imitation Leather Seat Covers will give your car a makeover; giving it the appearance of real leather, but doesn’t come with the same price tag as some genuine leather seat covers out there on the market. The quality of the imitation leather used for these truck seat covers is incredibly high. So much so that unless you know they are not leather, passengers sitting in your car will not be able to tell the difference. The fabric is both abrasion resistant and waterproof, while still maintaining a good level of comfort. While our Imitation Leather Leatherette Seat Covers are extremely high quality, we will do you one better by offering you the Luxury version of Imitation Leather. Our Sof-Touch Imitation Leather Seat Covers are a step up in the world of leatherette materials. Our Luxury Line also offers the addition of perforations for both and rear seats for air conditioned and heated seats. The Sof-Touch Seat Covers we sell qualify to be a part of our Luxury Line due to the intensive amount of care and attention to detail each set of seat covers go through during production. 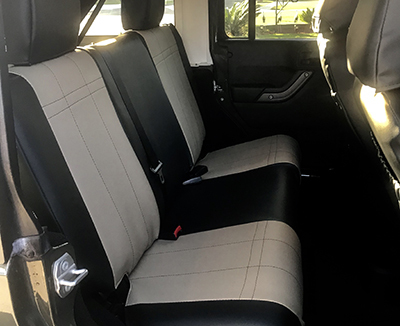 NOTE: We offer both Imitation Leather and the Luxury Sof-Touch Leatherette because we know that budget can play a factor in purchasing seat covers. We want you to have the option of buying leatherette seat covers regardless of your seat cover budget. Both come with our fitment and quality guarantee. There’s still the option of opting for the real deal Genuine Leather Seat Covers, of course. These high quality Leather custom seat covers are designed for customers who want to the real deal, but don’t want to fork out piles of money for a reupholstery kit. These slip over seat covers are custom made for your specific year, make, and model of truck. They are waterproof, UV protected, and abrasion resistant; giving you both full protection and the comforts of leather in your truck. Keep in mind that while you may be looking for a leather upholstery kit for your vehicle, you may not actually need to replace the existing fabric. 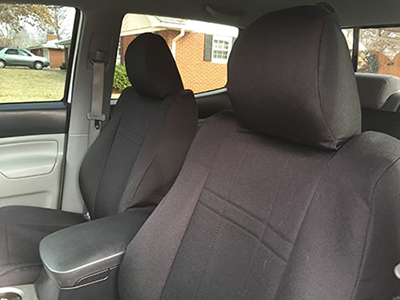 This can be extremely costly and in many cases, a good custom seat cover will do the trick. 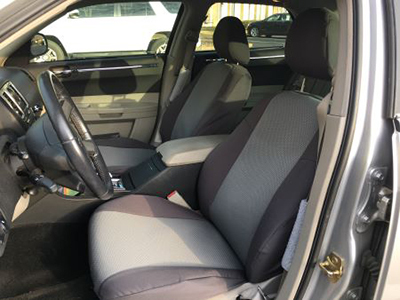 Seat covers are ideal for covering up blemishes, wear, cracks, and tears in your truck seats that can sometimes make the seats very uncomfortable - not to mention - pretty ugly. When shopping for the best seat covers for your truck, you should keep in mind not only what you like, but what you need. There’s no sense in ordering a heavy duty material if you don’t need it. Just like you should really be opting for something high-wearing and waterproof, if the seat covers are for your work truck. By selecting the right material that takes into account both sides, you’ll order a set of seat covers that are perfectly suited to your daily driving routine. In order to make it easier to select the right set of ShearComfort Seat Covers, try using our Suggested Seat Covers tool. This is a great way to pinpoint and narrow down what seat covers you should order.